Treasure Chest - a voice of New Life Church in West Linn, Oregon: What Guys Are Saying About Men's Ministry! I’ve been participating in the Men’s Leadership Ministry studies for almost a year and my life has been changed. These studies with the specific purpose of developing men into godly leaders have altered my relationships at home, community, and church. I am a better husband, father, and neighbor, and an outgoing Christian. Much more active in seeking His Word, in obedience and in being the Godly leader He expects me to be. I am grateful that the days of passively going to church and occasionally reading the Bible have been replaced with a yearning to understand His way and the faith to “get off the couch’ and be passionate for God. Just as iron sharpens iron, the men of my group help keep me accountable and continue to assist me in becoming the man God intended me to be. Their prayers, encouragement and wisdom have been critical during my transformation. 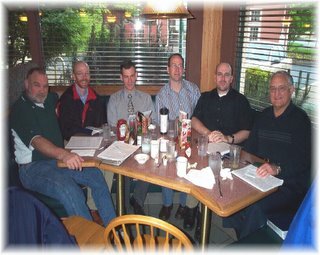 meeting with other men who are accountable to each other in knowing God’s will. This has caused a deepening of my relationship with my Heavenly Father and a strong desire to know Him better. T. S.